Jaipur, the capital city of Rajasthan is also its most popular. It may be called the city of pink but it surely has many other colours to its credit, a kaleidoscope of various hues its legendary spirit and ancient traditions and culture is reflected in all of its art, architecture, people and their lifestyles. A huge draw for tourist it is a dreamland replete with exotic forts, lavish palaces, evergreen gardens, friendly people, its rich heritage of art and culture and for its amazing jewellery, handicrafts and other shopping goodies. In this land where the royalty is still revered, there are many magnificent heritage hotels and deluxe palaces, choose from any of these for a truly royal experience. In the magical land of Rajasthan stands Chokhi Dhani, an ethnic village resort with a blend of rustic environment and modern amenities, built on sprawling acres of land, it is one of those rare 5 star ethnic resorts which imaginatively combines heritage and luxury. 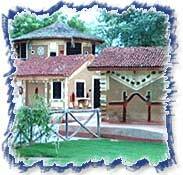 Chokhi Dhani contains a total of 65 air-conditioned cottages divided into 31 Village huts and 34 Executive huts. These cottages are spacious and laced with every modern amenity concievable, situated away from the hub of urban polluted life they offer soothing solace in the splendor of rich Rajasthani culture. The resort also provides 24 hrs. room service, H/C running water, telephone, special village tours at bissau retreat by camels, airport/station transfers, doctor on call, laundry, money changer, fax, e-mail, internet access, safe deposit, baby sitting, travel desk, special museum housing antiques, silver and armoury, shopping arcade, secretarial service, swimming pool and tennis. Bindola is the grand dining hall within the resort, it serves breakfast, lunch and dinner in Indian, Chinese and Continental cuisines. The kund is a magnificent swimming pool and the sprawling lawns near it can comfortably host a reception for as many as 2000 people, for recreation you could always enjoy a game of of billiards, table tennis and chess in the bamboo house. Situated on the Jaipur Tonk Highway, it is at a distance of 5 kms. from the Jaipur Airport, 18 kms. from the Railway Station and 18 kms. from the Bus Stand. Set over 47 acres of tranquil landscaped gardens the Rambagh Palace is an architectural masterpiece. This hotel was once the residence of the Maharaja of Jaipur. The palace is situated in the heart of the city, close to the main shopping areas and historical monuments. Hotel Rambagh Palace has over a 100 rooms including 12 Historical Suites, 3 royal suites and 3 Grand Royal Suites all of which have been aesthetically restored and allow guests an experience of regal luxury. All the rooms and suites are well equipped with facilities such as telephones, TV, tea/coffee maker and mini bar. Exquisitely decorated and overlooking gorgeous gardens, these rooms had once been the private chambers of the Maharaja. The hotel caters to every possible need, some of the many facilities it provides include 24 hrs room service, business centre, banquet and conference facilities, beauty parlour, shopping arcade, health club, swimming pool, tennis, jogging track, puppet show, folk dances, room service, H/C running water, telephone, T.V., safe deposit, channel music, doctor on call, laundry, money changer, safe deposit, baby sitting, valet, travel desk service etc. Situated on the Bhawani Singh Road in Jaipur it is at a distance of 11 kms. from the Airport, 5 kms. from the Railway Station and 5 kms. from the Bus Stand. More than 255 years old this Palace is a landmark heritage hotel, set amidst 18 acres of beautifully landscaped Moghul gardens it is a masterpiece in the Indo Saracenic style of architecture. It is a haven of unimaginable opulence and sheer luxury. The hotel offers a 100 rooms including 6 special suites, all of them overlook the breathtaking Moghul gardens or the swimming pool. 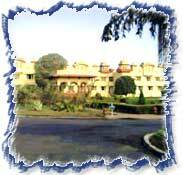 Excellent service and modern amenities make Jai Mahal Palace one of the finest hotels in Jaipur. It also has three conference rooms for small or large gatherings. For gatronomical pleasures, the Hawa Mahal, an open air lounge serves tea, coffee and snacks. Rang Mahal is the bar within, the Gulab Mahal serves fine Indian, Continental and Chinese cuisine and Phulwari is the open air dining option amidst the Mughal gardens. The hotels other facilities include a business center with copier/facsimile facilities and secretarial service. Solar heated swimming pool, beauty parlour, travel desk, car rental, shopping arcade, currency exchange, safe deposit lockers and doctor-on -call, Jogging track, table tennis, golf and horse riding arranged on request and intrestingly enough even an astrologer on call. Situated on the Jacob Road in the Civil Lines area of Jaipur it is 14 kms. from the Airport, 3 kms. from the Railway Station and 1 kms. from the Bus Stand. 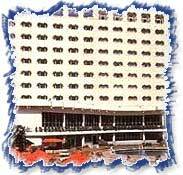 The Rajputana Palace Sheraton Hotel is owned and managed by the prestigious Welcome Group of Hotels. A cocoon of luxurious comforts it is world famous for its incredible services and warm hospitality. Built on a 7 acre landscape it offers a regal experience of authentic Rajasthan. The hotel offers 216 elegantly appointed rooms including 17 suites fully equipped with modern facilities like minibars, 24-hour laundry, 24-hour room service, internet and color TV. 88 of these rooms are categorised as the exclusive club rooms, with their business-related amenities and services they have raised the bar in corporate hospitality. This deluxe hotel also offers room Service, H/C running water, telephone, T.V., safe deposit at the reception, business centre, separate executive floor, executive lounge, banquet and conference facilities, beauty parlour, shopping arcade, childrens room, creche, movie lounge, health club, swimming pool, tennis, golf, discotheque, home theatre, recreational, doctor on call, laundry, money changer, baby sitting, valet and travel desk service. Situated on the Palace Road in Jaipur it is at a distance of 14 kms. from the Airport, 0.5 kms. from the Railway Station and 1 km. from Bus Stand. 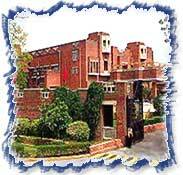 Hotel Clark Amer is situated in a posh resedential area at the heart of the pink city. An environment friendly hotel it has extended its high standards of services to many distinguished guest, business delegates, and tourists. It has one of the best Conferencing facilities and infrastructure in India for all categories of Business meets and conferences. 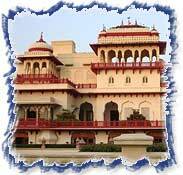 It provides leisurely and royal entertainment keeping with the spirit of Rajasthan. A stay here is a charming experience. The Hotel Clarks Amer has 202 Guest Rooms which have been categorised as 84 deluxe doubles, 116 standard doubles and 2 suites, these rooms are extremely cozy with facilities like STD/ISD, internet port in rooms, multi-chanel TV, 24 hours room service, business center, gymnasium, secretarial services, travel assistance, bank, post office, mini golf and more. For fine dining the Dhola Maru Restaurant, Durbar Dining hall, Surahi Bar, Jharokha Coffee shop and the Pool-side Barbeque with Rajasthani folk dances and Puppet Shows are truly amazing. Situated at J.L.N. Marg in Jaipur the Hotel is at a distance of 5 kms. from the Airport, 12 kms. from the Railway Station and 4 kms. from the Bus Stand.